Many translation management systems have appeared on the market. As a result, it is difficult to select the ideal system for your company. To have a translation management system that is relevant and adapted to your company, you must perform a step-by-step needs analysis. In this article you will discover the 5 steps to follow to make the right choice in selecting your translation management system. First of all, you need to establish your company’s requirements. The first step is therefore to analyze the expectations of each person likely to use the management system. This step is essential because it makes it possible to define the real needs of the company as well as those of the users. A good knowledge of your needs will make it all the easier to meet them. As an expert in the field, Consoltec can help you recognize your needs in order to propose constructive solutions. Being customizable, FlowFit can adapt to all your company’s needs. Consoltec is aware that all companies have different needs and offers you a custom system that adapts to your particularities. In addition, FlowFit is always ready to adapt to your current situation in the event of a change in your work processes. Secondly, you must classify and categorize the expectations and needs expressed in the first step. The secret is to prioritize requirements because no translation management system will be able to meet all your requirements. It is also important to categorize your needs by taking into account the different functions to which they may belong. Project management, integration of translation tools, customer portal and freelance portal, workload optimization, timesheets, statistical reports, customization and resource management are key features of FlowFit. FlowFit is customizable, allowing you to focus on your primary needs. A personalized approach is offered throughout the implementation process to ensure the success of your projects. FlowFit is a solution that allows you to simplify the management of your translation projects and thus improve your efficiency. In addition, the integration of a translation memory will allow you to obtain a complete and homogeneous system. Also, process automation will significantly reduce your project management costs by controlling your internal and supplier costs. The same applies to your project management time which can be reduced by up to 50%. The savings made thanks to FlowFit will yield a return on investment within the first year. You can also get information from other various companies who use translation management systems like FlowFit. We invite you to contact our clients such as Aviva, Radio Canada, Costco and many others. You can also find testimonials from FlowFit users by visiting the Consoltec website using the following link: http://consoltec.ca/fr/. Please be aware that Consoltec is an independent company with no links to translation agencies. 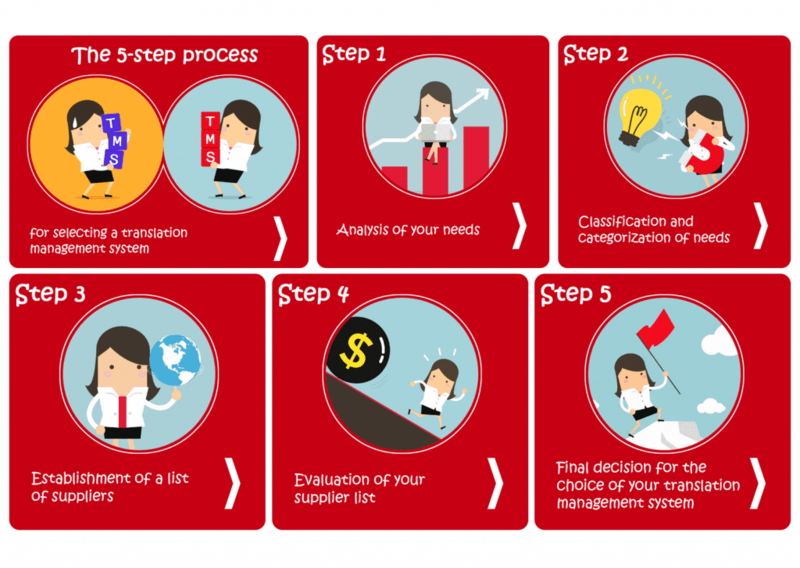 The fourth step is to evaluate your supplier pre-qualification list. As such you must write a request for information or a request for proposals. First, you can list all the priority needs on your information request list and see if suppliers can meet them. Also, the RFP is the stage where prices come into account. It will therefore be necessary to contact a seller in order to obtain an indication concerning the price. You can then carry out a pilot project. This is a practical step to extend your period of assessment, which is ideal if you have not made a decision yet. It is advisable to have a TMS installed and connected to the content systems to test the operation of this management system and see if it suits you. It is important to know that Consoltec adapts to the translation memory you use. Indeed, FlowFit integrates connectors with several translation memories such as MemoQ, SDL Trados, and LogiTerm. FlowFit also offers a free 30-day trial to test the product to ensure it meets your requirements. The fifth and final step is the decision. This stage is the result of the various actions carried out previously, the analysis and classification of stakeholders’ needs, the list of suppliers and its evaluation using requests for proposals and requests for information, as well as the pilot carried out. These actions will lead you to a clear and thoughtful decision for the selection of your translation management system. FlowFit is a constantly improving application. By choosing FlowFit, Consoltec ensures you will have access to the latest skills and technology while offering you high quality solutions with consulting and adaptation services. Indeed, Consoltec’s research and development department makes a considerable amount of effort to ensure the optimal evolution of solutions to better fulfill your growing needs. To further satisfy you, Consoltec can integrate several parallel services relevant to marketing, communication, or production. This evolution can help you standardize processes from one service to another according to your needs.